A Maryland man suspected in the disappearance of an 8-year-old homeless girl is also wanted in the fatal shooting of his wife. Police said Khalil Tatum is the prime suspect in the Feb. 26 disappearance of Relisha Rudd, who lived with her mother at the Washington, D.C. homeless shelter where he worked as a janitor. An Amber alert was issued for Rudd Wednesday, according to WJLA. On Thursday, Tatum's wife was found shot dead in a motel room that police searched as part of their investigation. Cops think Tatum pulled the trigger, and that he took the girl with him when he fled. Police found Tatum's white 1976 GMC truck in Hyattsville, Md., on Thursday evening, but the suspect and the girl have yet to be found. The FBI has joined the search for Tatum, who is considered armed and dangerous, CBS News reported. Administrators at Relisha's school contacted police after she failed to show up in class for several weeks. The girl's mother, Shamika Young, refused to file a missing persons report, according to WRC-TV. In a tearful interview with the station, Young said she had known Tatum for years, and that she trusted him with her daughter. "I didn’t see anything wrong with him. He’s a good guy," Young told WRC-TV Friday. "When [Relisha] did go out with him, he brought her back. He would take her shopping, took her to see Disney on Ice, he bought her a tablet for Christmas, took her out to eat with his granddaughter." She pleaded with the suspect to bring her child home. "Bring my daughter back to me right now, please," Young said. "It’s crazy. I want to know what’s going on." 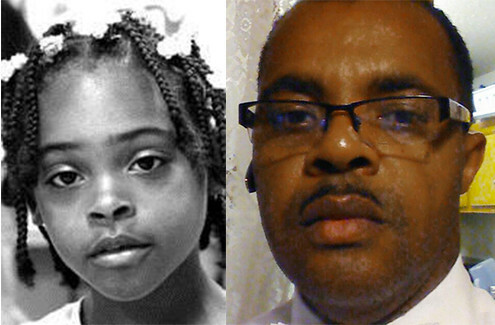 Critics of the case are outraged that it took so long for Relisha to be reported missing. Jamila Larson, executive director of a non-profit that works with homeless children in Washington, told WJLA that the girl's disappearance should have never happened. “We’ve been trying to sound the alarm that the city needs to invest more services and more support and more eyes on these precious children to make sure their needs are being met and they’re not falling through the cracks," Lawson said. Relisha is described as a black female, standing 4 feet tall and weighing between 70 and 80 pounds, with black hair, brown eyes, and a medium complexion. Police ask anyone with information on Relisha's whereabouts to call the Metropolitan Police Department at 202-727-9099, the Youth Investigations Division at 202-576-6768, or 911.